Ellyana Moore is Officially Four! In the midst of preparing for upcoming trips and support raising, we happily celebrated our little girl’s 4th birthday last weekend. As all parents know, the time really does fly when you’re having kids and that fact continues to be impressed on us the older ours get. 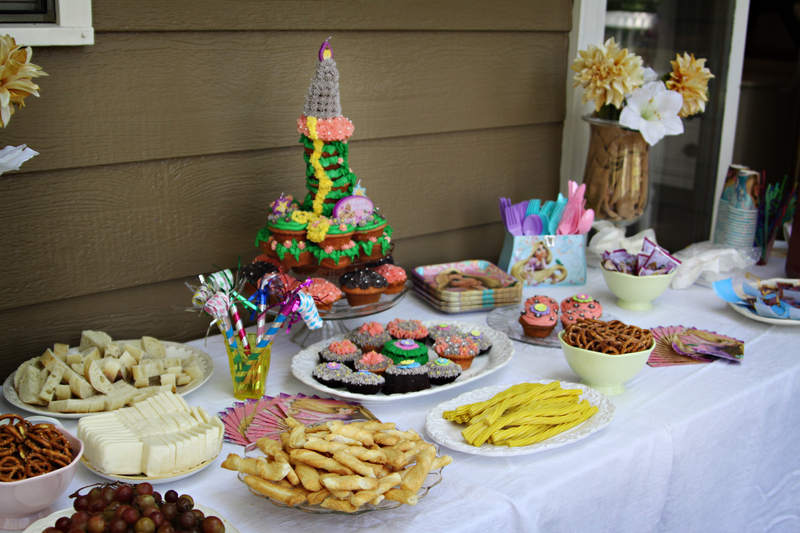 So, Elly and I began researching Pinterest and Google for ideas and eventually came up with a great little set of D-I-Y crafts and whimsical recipes for her big day. She had most definitely decided that the party was to be a Tangled-themed party as that’s her favorite movie and princess right now. Then we set to work prepping for the big day! We found a great source for all things Tangled and were even blessed to happen upon a 30% off entire purchase coupon on the way to the store (keeping us at just 19 cents over budget)! Everything was really coming together. But the biggest element to this shin-dig for me was the Grand Finale, as it were. Several weeks ago as I was researching Rapunzel dresses, I happened upon a local company called Wands and Wishes where a singer/actress comes dressed in costume and does face-painting, sings songs, reads a story, plays games, gives princess dance lessons and takes portraits for a very modest price. I called immediately and found that yes, they had Rapunzel and yes, she was available for Elly’s birthday weekend! I was in Mommy heaven! As the day approached I got more and more excited, admittedly even a wee bit obsessed…late night shopping trips with my mother-in-law, 1 a.m. iPad research sessions that I couldn’t pull away from…you know, the normal stuff. But come Friday night finally, we had it. We had even managed to make a Tangled Cupcake Tower from scratch-icing and all! This was hands down going to be the best party I’d ever coordinated (and anyone who knows me knows, there’s been alota parties!) But what remained center in the midst of all of this was who this was for and why. It wasn’t so I could drown myself in materialism before we leave for the field. It wasn’t so that we could demonstrate to our friends our resources or anything. It was all for a little girl who is full of life and love. A little girl whose giggle gets into your heart like nothing else. A little girl who is all princess right now and the apple of her parents’ eyes. A little girl whose friends and family love her to pieces. This was for her. Not to spoil her per se. But to continue planting the seeds of love and adoration in her little heart that one day she would in turn do the same for the world she’s a part of. So, we began her birthday with a breakfast with just Mommy and Daddy, where she received her brand new Tangled Dress (yay, Craigslist) and tiara and then headed over to the party to finish setting up. As her guests arrived her grin got bigger and bigger. We all enjoyed yellow Twizzlers and Golden Flower Punch as the princesses and princes chased “each other to their hearts content”. And then, she arrived! 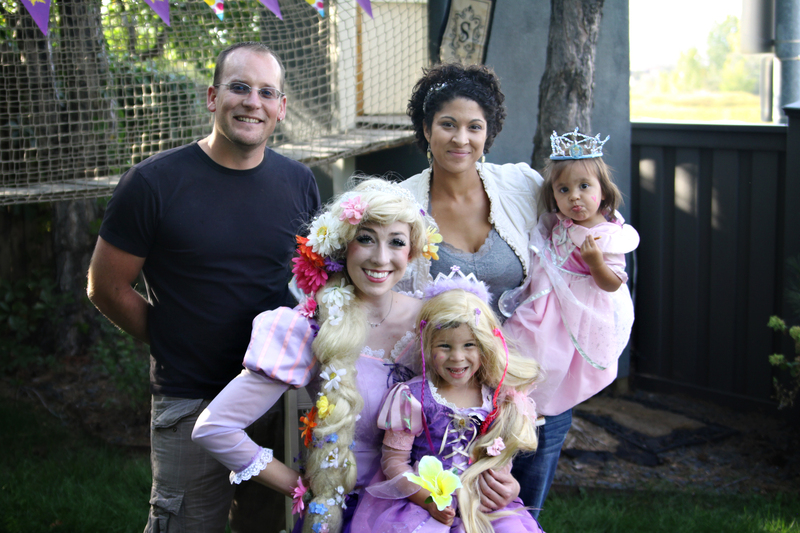 Princess Rapunzel was as sweet and kind as we all “knew” her to be and the kids couldn’t get enough of her. It was everything I had hoped for! (click here to see the pictures). Elly blew out her four candles with the “real” Rapunzel by her side and I couldn’t help but think of how God is always by our side as well. I felt His presence throughout the planning and preparation of this party and knew that my Heavenly Father cared as much about this as I did. His mercies to me throughout were so sweet and made me feel such love and adoration from Him. He loves His children more than I love mine and like me, will stop at nothing to make sure we all know it!! As we have been busy this past summer, selling our house and possessions, living with family and raising support, we’ve also been attempting to simplify the car situation. An attempt that has remained just that, an attempt. 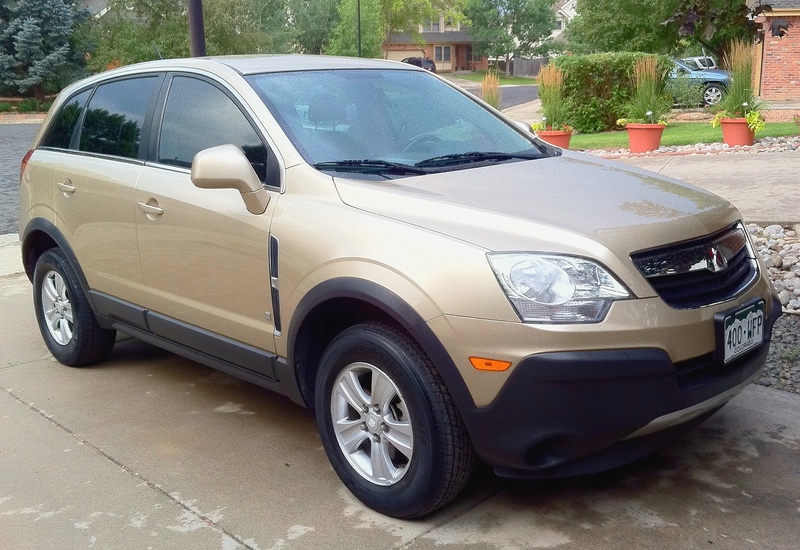 We cleaned and detailed our beautiful golden cashmere 2008 Saturn Vue and then posted it on Craigslist with visions of someone swooping in and relieving us of a car payment we can’t afford anymore within that weekend. A few lookers, no buyers and there we were. We made it through the summer with no more interested parties, despite repeated posts and then the problems started. A few weeks ago we were slammed with a busy schedule, cranky girls and particularly nasty allergies, when I came out one more morning to find a flat tire. Clinton had already left for work with the other car and we were officially stuck at home for the day. My “very important” agenda was sufficiently, um, deflated. As we are on a restricted budget these days in preparation for our move to Kenya, the usual solutions weren’t available to us. So, he called around and surprisingly found a great deal on 4 newer tires. He placed the order but they weren’t going to be able to get here for a few weeks. We spent a couple of weeks getting by with the other vehicle and praying it would all work out. The other vehicle is our every trusty, cherry red, Suzuki Sidekick from my college days, if you can believe it. That car has been on it’s last legs for at least 5 years and we’re sure it has no idea how old it really is or how many miles it’s logged (170,000+). Well, in the midst of all of this, it figured it out. As I was taking the girls to go grocery shopping one blistery afternoon, the Suzuki refused to go into gear at a light. Then it started shaking, a lot. Another light, no gear and now the clutch was gone. This was bad. The Suzuki managed to crawl home and we were stuck again. As I felt the tears welling up in my eyes and the vapors of frustration begin to make their assent in my heart, a UPS truck pulled up to the house. The tires had arrived early and they were perfect! True to form, the Lord had worked the timing out just right. Even though we are still trying to sell the Saturn, we are grateful that we will have such a great car to take on our trip to Branson, MO. for a conference this next week. We know that our God has a plan for our vehicles and that He will work it all out to His glory. September Update from the Field! We’ve just received the latest newsletter from Colin and Fey in Nairobi (see below)! God is at work and opening amazing doors! “We…have seen a number of ‘doors of opportunity’ opening up before us, including our new CellKenya office at SIM. Nairobi Cathedral is expanding the number of cells from the 40 they started, by talking about small groups at every service during September with the aim of launching 200 more groups. We begin to train all the new leaders they will need on the 13 October. This immediately follows our CellKenya Network Consultation, and we are excited by the growing response from leaders of cell churches across Kenya who plan to attend. This feels like the birth of the network we have always envisioned and prayed for. We have just returned from an 8 day, 1200+km training trip to Western Kenya and the North Rift Region with David. 6 training sessions enabled us to envision and teach cell principles to another 267 people that included 64 pastors and 3 Bishops from 69 different churches. The 3 groups we gave cell vision to have now booked us to come back to train them fully next year. Two interesting sets of stories from that trip stand out amongst the many great experiences we had. The first is from a church near Kakamega where we gave the pastor vision for cells in only April this year and we’d returned to begin to equip the cell group leaders. Over 60 people turned up and we found that they had already begun five cell groups. One cell felt particularly called to reach out to HIV/AIDS sufferers and now had many in their group receiving acceptance, love and support from the other members. A second cell, some distance from the church, grew quickly and planted a new church in their community. Already they have 5 cells effectively ministering to that community. The mother church has also had to enlarge its premises to cope with increased numbers….all this in just six months! The second story comes from the Pentecostal Assemblies of God Annual Pastors’ Meeting in the Nandi Hills region. We were asked to share vision for cells as part of this gathering. Whereas the two training sessions we had already conducted were exciting and full of fun, this group was so serious and seemed distracted by our presence. We were told the highest ranking minister in their denomination was due to call in briefly and when he arrived could we please stop to give him space. We did so and he spoke forcibly to everyone in Kiswahili, calling five people out by name and making them kneel in front. We were then instructed to join some others and lay hands on them. After a long prayer we returned to our places and asked David what was happening. We found we had just ordained five new pastors! Divine appointments never cease to surprise me, really. Even though they’ve been happening more and more lately. Something about moving forward in faith, though it makes no sense and seeing something unexpected come of it. Something that is down to the minute or a ‘chance’ meeting continually brings about an exhilaration to the spirit. I say this as we are preparing to take a road trip with the girls to Branson, Missouri next week for a conference. A conference that we not only wouldn’t be attending but hadn’t even heard of two months ago. It was an early Sunday morning and I was wide awake. Not typical for a mother of two little ones. But there I was in the dark of early morning, eyes wide open, and my heart hearing a still, small voice. We were going to church that morning. Now, going to church for us on a Sunday morning was unusual. We had been attending church services on Friday and Saturday nights at other congregations for some time. But this morning, we were going to church at my home church of 10 years. A place I hadn’t been back to in over 6 years. As I felt the confirmation in my heart I asked my husband, Clinton to confirm it in his. He came back with a yes and something extra. He said, “Yes, we’re supposed to go there this morning, and I heard the word, ‘ENGAGE. '” That’s all we needed and we were off on another adventure with the Lord. We pulled up to my old church full of curiosity at what the Lord was up to and before we even got to the door, who did we run into but my former pastor! He is the District Pastor now and it turned out he hadn’t been there in 2 months and was only there for that one service. God was moving. That was obvious. After the service we were talking with the new pastor and getting to know him a bit when my former pastor walked up. We had the chance to share with them a bit about Kenya and the call on our lives. My former pastor immediately said, “Well, you guys really need to come to the District Conference in October as missionaries. We’d love to pray over you.” It turned out also, that the new pastor is a missionary kid from Chili and as such has a huge heart for missions. That afternoon we marveled at the Lord and how the morning had gone. We saw doors open for us with the meeting we’d set up with the new pastor and the conference we needed confirmation for. Just then, there was a message on Facebook for us from my former pastor. He had sent us information on the conference. It was called, “Engage”. So, here we are 5 days from leaving and again full of curiosity at what the Lord will be up to in Branson. Perhaps a few more divine appointments? We can count on it!